During the walk last year that we did up to the castle of Sant Miquel in the Gaverres (Girona and Castell de St Miquel), we didn't take any photos. This is a short walk in to the valley of Sant Daniel behind the cathedral. For its proximity to the city, it's still amazing to think how quickly you can get into open countryside and farms and rural buildings. We took the northern road into Girona down past Pont Major towards the centre and parked by the river just below Montjuic to save having to navigate Girona's one-way system. From here we walked under the railway into the older part to where the old walls meet the road up to Montjuic (and up to Girona's Ciutadella). We then head up on the right hand side of the Sant Daniel valley to the Jardins de John Lennon which climb up to the city wall. 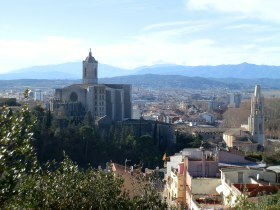 At the top is a gap in the wall with signposting to the Torre Sutxet and viewpoint as there are excellent views across to the cathedral. We follow the path past the old tower, then along the side of the hill as it curves around the corner giving views out to the Gavarres. The path curls around to the head of the next valley and some executive housing and we come down the hill past a farm and in towards the Monastery of Sant Daniel. Crossing the stream at the bottom through a small park we start going up past a small font and then follow a dirt track up to the top of the cathedral side of the valley and along to the city walls. Finding an appropriate point through the walls we can then enter the old city from close to the Casa del Alemanys. When the city was founded in Roman times the wall from Alemanys down to the Cathedral would have been the extent of Girona on this side, and from Alemanys down the lane, the left hand extent of what was a tiny triangular city by comparison to today. 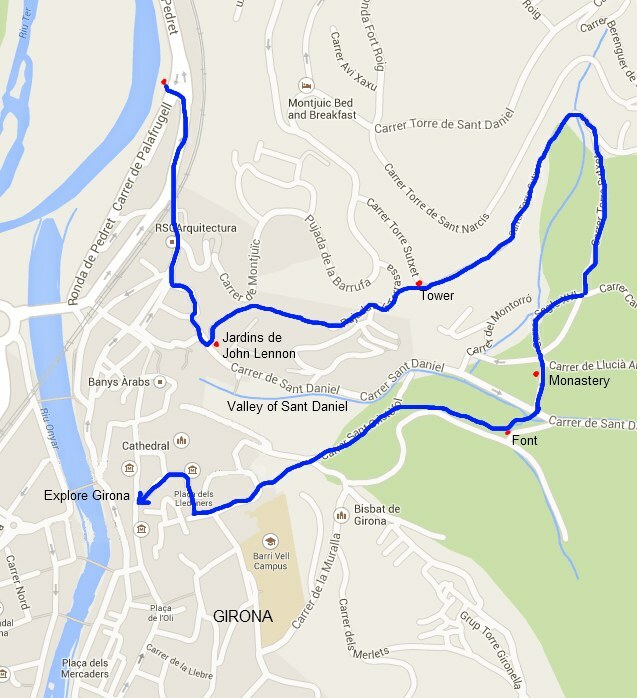 Not a long walk, but something to provide a different perspective to Girona to the old streets and modern shops.